I have been having a lot of fun with my new bread machine. I’ve mostly made 100% whole wheat bread for sandwiches, but I’ve also been making spiced pumpkin bread which I also use for sandwiches. 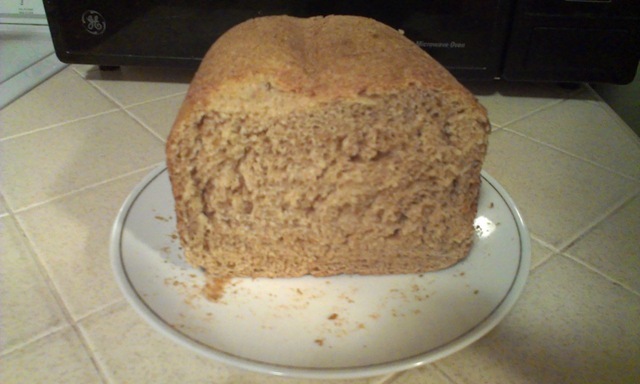 The picture above is my first attempt at making bread, this one is wheat bread, not 100% whole wheat. Not every loaf of bread comes out perfect though, in fact, I had no idea that my dough has been too dry until now. The other day I made a loaf of 100% whole wheat bread and it came out smaller than usual, and when I took it out, it was really thick and hard. I cut the slices and noticed that it wasn’t light and fluffy at all, which is how bread should be, but decided that I will just go ahead and eat it anyway and hope for the best. Last night I had a sandwich with that bread and had the worst stomach pain in my life about 6 hours later. I don’t know if it was the bread, or a combination of the bread and all the pretzels that I ate and the fact that everything was dry that was causing the pain. I had a heating pad on my stomach for nearly an hour. I decided to do a little bit of research, which I should have done to begin with. I found this website called Salad in a Jar with 6 Bread Machine Secrets for Beginners. I am glad I found that because I found out that I’ve been doing it wrong all this time. My bread is always the same consistency, but never touches the sides of the pan. It’s always a hard ball in the center of the bread machine that just spins in circles. I didn’t know it had to touch the sides. So now I know why the bread is so thick. The person who wrote that blog post said to use the bread machine to knead the bread, but then transfer it to a bread pan and bake it in the oven. Well, I don’t have that luxury because I don’t have a normal oven. Well, we have a normal oven, it’s just old and I never use it. I bake everything in the toaster oven, which is why I bake the bread in the bread machine. So now that I have this new knowledge, I am going to attempt to make a regular loaf of wheat bread, not 100% whole wheat. I will make sure it has enough water and is tacky and sticks to the side and is not too dry. I really want my bread to come out light and fluffy and not too heavy and I want it to taste good. I also want my partner to like it so he doesn’t have to buy his own bread from the store, which was the whole reason I have a bread machine lol. I don’t blame him for wanting to buy bread, because it is too hard to eat, so I really hope it works out now. I have my fingers crossed. I have my eyes crossed for good measure.